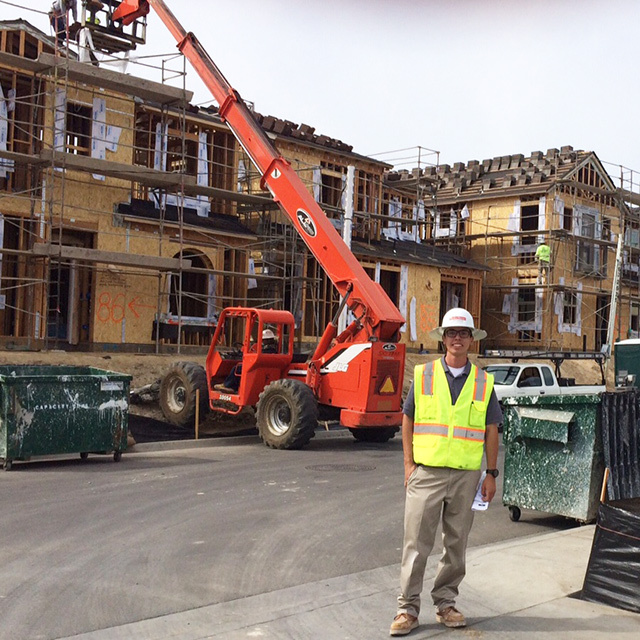 SDSU Construction Supervision Graduate, Mark Gonzalez, now works for Pardee Homes. 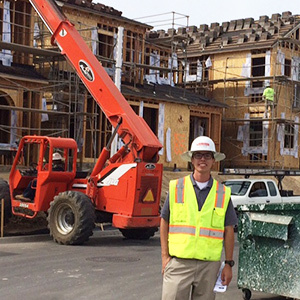 In just two years, Mark Gonzalez went from being a college student working as an entry-level intern, to an assistant superintendent for one of the Southwest’s most award-winning builders. How did he do it? While in his junior year of pursuing a bachelor’s degree in public administration at San Diego State University, Gonzalez began looking for a program in construction management to supplement his internship with a local general contractor. Through SDSU’s College of Extended Studies, he found the Construction Supervision Professional Certificate program. His résumé immediately began getting noticed more on LinkedIn. In June 2015, Gonzalez received an offer from Pardee Homes. What do you think are the Construction Supervision program’s biggest strengths? Having the courses 100 percent online made my success possible, as I had a hectic schedule – so it was great that I didn’t have to report to a class at a regular time on campus each week. I could adjust my study time each week depending on what I had going, so I really appreciate the amount of flexibility the online courses provided. Furthermore, each assignment is built to encourage you to collaborate with your online classmates — you can then learn even more from the standard readings, as each person often builds a discussion based on past real-world experiences. Can you speak to the quality of the instructors? I really liked the fact that instructors had an extensive background in construction, and asked us to draw from our own experiences while going through the coursework and assignments. The modules and reading material were put together in such a way that was simple, to the point, and easy to comprehend. I’m still drawing from much of what I learned in these courses in my line of work on a regular basis. How did you get the internship you had prior to taking the Construction Supervision courses? Since I can remember, I’ve always had an interest in architecture and construction – growing up, I was a part of the ACE Mentor Program in high school. This after-school program was sponsored by a general contractor who brought in industry professionals to teach us the basics, and mentor us as we completed our capstone project. It entailed designing and building a mock schedule, budget, and model. At the end of the year, we presented it at our region’s yearly building association meeting, and got to network with many professionals in the construction industry. After graduating high school in 2008, I received an offer for a paid summer internship with the general contractor that sponsored my school! Interning summers turned into working part-time through my college career, providing me with a good foundation with practical, real-world experience. What does your typical day look like working for Pardee? I absolutely love my job — I get to interact with many people on a daily basis, and have come to learn so much about each trade. As assistant superintendent with Pardee Homes on a tract development, I’m given an enormous amount of responsibility and the ability to make big decisions on a regular basis. Those decisions I make can really make or break our baseline project schedule — so there’s always a lot of critical thinking, looking ahead, and coordinating between all the trades on site. On any given project, I’m in contact with close to 100 different people! So good note-taking and record-keeping is a must. Construction management is a good balance for me, as the job requires some computer work, field management at the job site, and providing good customer service interacting with homebuyers. Do you have any advice for others seeking to enter or advance in the construction industry? Networking is key to being successful in the industry. It’s the way many find out about new jobs, and you get your name out there. It really is about who you know! In today’s job market it’s important to have a proper, well-rounded education tailored to your career path, and the Extended Studies program provides just that. Getting experience through internships and never turning down a job prospect can lead you to big places in this field. I know many people who started as laborers and in entry-level positions and are now in supervisory positions running jobs. Just two years ago I was a college student working as an entry-level intern, and now I’m in a management role as an assistant superintendent building new home communities. Hard work, dedication, and persistence will go a long was in getting started and moving up the job ladder! Taking courses through SDSU’s Extended Studies program is one of the best educational investments I’ve made! SDSU’s College of Extended Studies offers five online Professional Certificate programs in Construction: Construction Supervision, Civil Sitework, Construction Estimating, Construction Practices, and Construction Project Management. For more information, please visit neverstoplearning.net/construction.